We’re in the midst of another industrial revolution: Industry 4.0. Coined at the 2011 Hannover Fair in Germany, Industry 4.0 is a high-tech strategy that marries computerized manufacturing and the Internet of Things to create so-called “smart factories.” In the Industry 4.0 age, factory robots communicate with each other and with humans using cyber-physical systems, internet-enabled communications, and cloud computing. This newfound communicative ability allows them to complete tasks that are too difficult or too dangerous for humans, provide information and visualizations to aid humans in decision-making and— most remarkably—make decentralized decisions and perform tasks autonomously. While the theory behind Industry 4.0 is well-developed, little research has been done to find out how this new-age manufacturing industry will affect existing businesses, how they can adapt, and how they can stay relevant. That’s where Productique Québec steps in. As a technical consulting company, Productique Québec is well aware that Industry 4.0 could change the way Canadian manufacturers do business. But until recently, they lacked the research to back up their understanding. So they engaged Mitacs to bring on a student researcher to do just that. 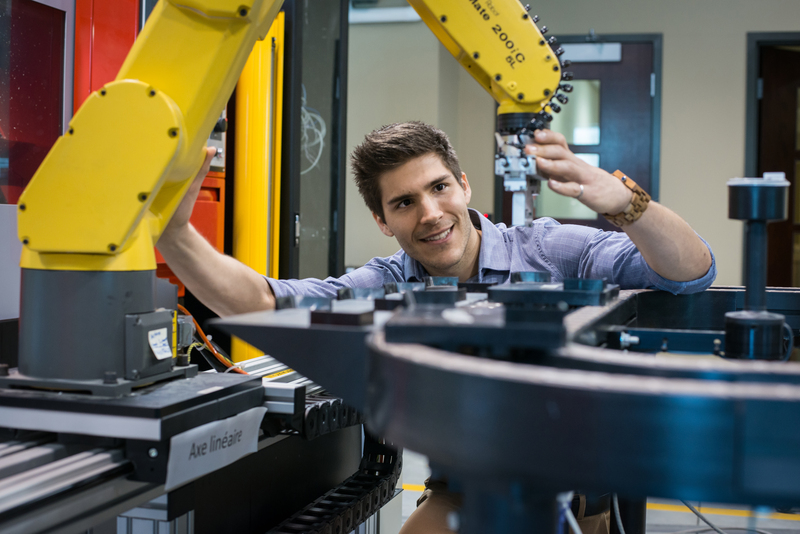 Soon, student researcher Sébastien Gamache from Université du Québec à Trois-Rivières set out to compare current Industry 4.0 practices worldwide and develop a plan of best practices. He used this research to help Productique Québec and the Government of Québec to develop tools to support a digital strategy for manufacturers that will launch this fall. “Industry 4.0 can have a huge economic impact for businesses in this country,” says Houle. “And it won’t be the last revolution we see,” adding that by doing research, they’re able to find out the best way to make data and technology work together — so the right information can get to the right people, at the right time. “Now that we’ve reinforced our understanding of what we’re dealing with, we’re better suited to make recommendations to the businesses we support,” Houle says. Productique Québec has already engaged Mitacs to complete a second research project that will build on the success of the first one. And Gamache? He recently presented at a conference in Tunisia about Productique Québec’s findings on Industry 4.0. “Our Mitacs intern, Sébastien, did such a great job on this project — we wanted to shine the spotlight on him and give him a chance to share his knowledge with the world,” says Houle.